Today has been closet day. We live in a tiny house with tiny closets which requires me to pack my out of season clothes in the basement. So today I finally switched my spring/summer things for winter. It is always a daunting, boring, tiresome task but gives me the chance to purge my wardrobe of clothing l don’t wear and to take stock of what l do have that l may have forgotten. In the past, l was more indecisive and willing to give old things a second chance even though l knew in the back of my mind l would never wear them again. Not this year! 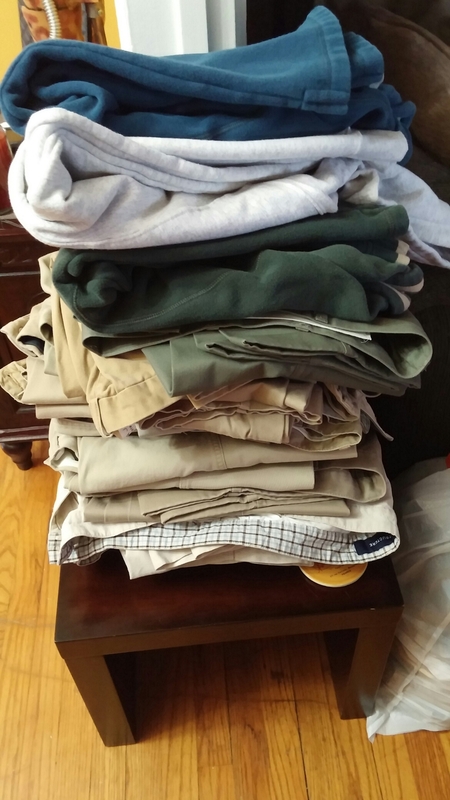 Today’s pic is a stack of pants and three hoodies l took to the basement last year. I don’t wear them or they are not my size so this year l am donating them. I also filled a bag with shirts and shorts to donate. I counted a dozen pair of good jeans in my closet that l can wear. Some even still have tags on them! But l always wear the same couple of pairs week after week. The same goes for khakis! And l do laundry every weekend! Next year my plan is to wear more and wash less. Or at least less often. Utilizing more of what l do have while hopefully saving some water and electricity too. For now though, l am quite happy donating these clothes to save some space! Interesting post, its made me think a bit! I have plenty of clothes under the bed and in the loft, which I couldn’t even tell you the last time I wore them> Maybe if I haven’t missed them in the last 15 months since we moved into this house and I put them there, then its time to get rid of them? Absolutely! I’ve heard the rule is give it two seasons and if you haven’t worn it, get rid of it. A coworker told me to hang the hangers backwards and turn them around as you wear things. Anything left with a backwards hanger at the end of the season goes too. I am trying that this winter.